Well, it was about this time last week that I was finishing up that two-part series on the Netflix algorithms versus what I really like in SciFi and Fantasy movies. That and starting what was supposed to be this week's blog, which was supposed to be about how - in some stories - the way a character celebrates a holiday can be a powerful backstory development tool. Then a thing happened on Friday and I really, really had to set that post aside. 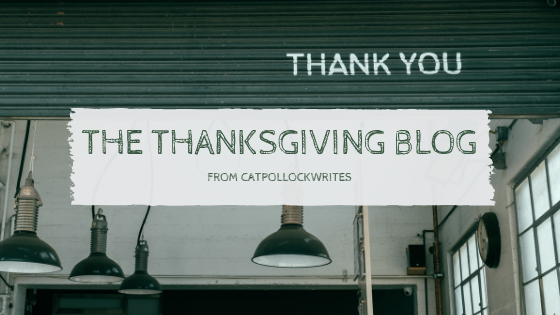 I'm still planning to finish the above-mentioned post, just… not in time for Thanksgiving. My dad had a heart attack. Again. The last time that happened (four years ago), I was thousands of miles away, doing the Lord's work and all that jazz. And I could easily sit down and try to write a blog where I process everything that happened then and now, but I'm not. Like last time, I'll be crying and realizing most of what I said belongs in my journal… not on the internet. So I thought instead I would make a short list of the things I have been thankful for since Friday. This heart attack was not nearly as bad as the last one. I know this list could be a hundred times longer, but I don't want to keep those of you celebrating Thanksgiving (or Friendsgiving, if that's who you're spending the time with) any longer than I have to. The point is simple, and probably the same one most of us have had hammered into our brains from as far back as we can remember. Take a pause. Be thankful for what you have. But I would tack this onto that - "especially the people you love who love you in return. There isn't much more precious in the world than that." Happy Thanksgiving, guys. Praying yours is a good one. P.S. - In case you were wondering, my dad has been home since Sunday, and is resting and recovering as well as can be expected. He does pop onto this little blog every once in a while, and if you leave a comment wishing him well, he just might see it.